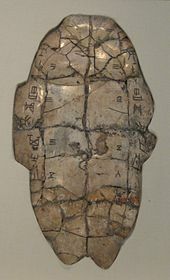 ) of zhēn (貞) "to divine"
) was also used for the verb "divine" in the oracle bones of the late Shang dynasty, which preceded the Zhou. 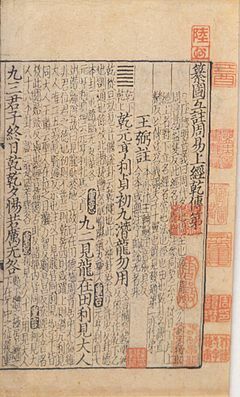 It also carried meanings of being or making upright or correct, and was defined by the Eastern Han scholar Zheng Xuan as "to enquire into the correctness" of a proposed activity. Kern, Martin (2010). "Early Chinese literature, Beginnings through Western Han". In Owen, Stephen (ed.). The Cambridge History of Chinese Literature, Volume 1: To 1375. Cambridge, England: Cambridge University Press. pp. 1–115. ISBN 978-0-521-11677-0. Knechtges, David R. (2014). "Yi jing 易經 (Classic of changes)". In Knechtges, David R.; Chang, Taiping (eds.). Ancient and Early Medieval Chinese Literature: A Reference Guide. 3. Leiden: Brill Academic Pub. pp. 1877–1896. ISBN 978-90-04-27216-3. ——— (1993). 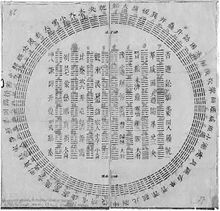 "I Ching 易經 (Chou I 周易)". In Loewe, Michael (ed.). Early Chinese Texts: A Bibliographical Guide. Berkeley, CA: Society for the Study of Early China; Institute for East Asian Studies, University of California, Berkeley. pp. 216–228. ISBN 1-55729-043-1. ——— (1999). "Western Zhou History". In Loewe, Michael; Shaughnessy, Edward (eds.). The Cambridge History of Ancient China: From the Origins of Civilization to 221 B.C. Cambridge: Cambridge University Press. pp. 292–351. ISBN 0-521-47030-7.